One hot summer breeze in NZ, was magnificent. Because it is usually dirty and old, but now it is beautiful. The grass was green, the oats were yellow and the hay was dry to roll in. It was amazing! There were ducks that built their nests under burdock. This mother duck had 6 eggs, 5 eggs were pure white..and the 6th egg was grey and ugly. The duck was always puzzled about that egg, and how it came out so different than the rest. These ducks are not clever at all, and are not quick at counting, so this mother did not worry herself about the matter, but just took care that the huge egg should be as warm as the rest of the eggs. Those eggs were the first ones that the duck has laid. She was very pleased and proud, and laughed at the other mothers, who were always neglecting their duties to gossip with each other or to take little extra swims besides the two in the morning and evening that were necessary for health. The mother duck was looking at the eggs about several times waiting for the time to come. But it never happened. “My eggs are taking way too long to hatch” she said to herself. 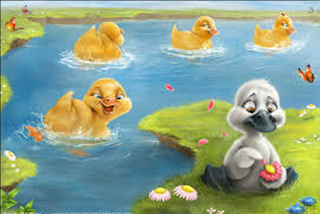 But still, she knew if she went and left the eggs and the ducklings in them to die. Then her friends will never speak to her again. So there she stayed. The only time she has to get off is so she can check if it was cracking. Which may have been the reason why they have not cracked sooner. She had been looking at the eggs for one hundred and fifty times.....and finally two eggs cracked. The mother duckling was filled with joy and happiness. So she got them all together and never moved again. The next morning she was rewarded by noticing cracks on all five of them. And in midday she saw two heads poke out of the shell. Before the sun arose the five white eggs were empty, and ten pairs of eyes were gazing out upon the green world. Now the ducks had been carefully brought up, and did not like dirt. Besides shells are not very comfortable for you to walk on or to sit on. So she moved it to the side, and felt delighted to have some company to talk to till the big egg hatched. So when the big egg hatched, other ducklings and ducks keeps on bullying him because of how it looked like because it was a swan. So he found a new family (which were swans) and they live happily ever after. Everyone is different. And no one, I mean no one is perfect!